I installed Linux on my 14 inch Apple iBook 1.33 GHz G4. I choose for Debian Lenny. Debian is a good distro and allows for easy updates. It comes with a good installer. Most of the stuff works right out of the box. I don't need KDE or Gnome. I try to keep the number of installed applications small. This to avoid lengthy update sessions. I am a great fan of GNU screen, and prefer textmode applications. My favorite windowmanager is ratpoison. Debian GNU/Linux with ratpoison and GNU screen solves the biggest issue of the iBook running Mac OS X: it makes the desktop very efficient to work with and totally free. 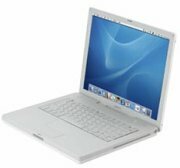 Mac OS X makes the iBook visually more appealing, but a lot less efficient. My iBook offers dual boot: either boot OS X or boot Linux. After installing Debian I was very curious about hibernation. It worked right out of the box! when the machine comes back to life after hibernation, the wireless network connection needs to be poked. See below. There are a lot off different ways to get your wireless network connection up and running. My choice was to use wpasupplicant. This is very easy to do and don't require KDE nor Gnome. It only take five steps to get your wireless network running. After this, reboot and if everything is OK, you will have wireless network. If you don't use static ip-numbers but DHCP, you will have to adjust the last three lines in /etc/network/interfaces accordingly. I did an apt-get install alsa-base. After running Alsaconf the sound works. But don't plan to have a party playing music from your iBook. The speakers are of poor quality. My (much cheaper) old IBM R31 laptop sound much better.